I recently started a 10-week Beth Moore video study on David at our church in Austin, TX, Gateway Church. Having done a Beth Moore study before (Daniel), I was overjoyed when I saw this study and quickly registered. I’ve always been drawn to David, as he is a deeply flawed human who committed adultery and had someone murdered, yet he is described as a man after God’s own heart. I don’t know about you, but that gives me hope! If you’ve ever done a Beth Moore video study, you are familiar with the format of a weekly video teaching by Beth herself, which is about an hour. There is an accompanying workbook to follow along and fill in blanks. Then, before you meet again for the next video, there are 5 days of homework, each last about a 1/2 hour. I really like doing my homework first thing in the morning, because being in God’s word first thing in the morning sets a positive tone for my day. 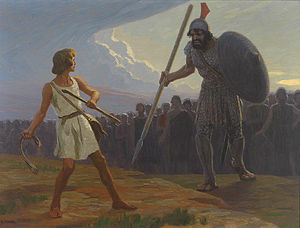 So what’s interesting to me is that pretty much everyone is familiar with the story of David & Goliath, but it’s one of those stories that I’ve never really given much thought to, or studied in depth. It was NOT what attracted me to this David study and it’s not the first thing I think of when I think of David. I certainly didn’t think that the day’s homework that would inspire a blog post would be the day studying the story of David & Goliath, but it was! So what is it that first grabbed my attention and made me equate David & Goliath to dieting? Beth’s second point for the day got me: Measure the size of your obstacle against the size of your God. She points out that we tend to measure our obstacles against our own strength, so we feel overwhelmed and defeated before the battle begins. I did not feel that way when starting SlimGenics, because I gave it God and looked for victory through Him, not through myself. I knew I would have to do the work and rely on what strength I did have, but He would give me victory; the victory would not come on my strength alone. However, since reaching my goal and striving to find balance, I have somehow fallen back on my own strength and stopped looking for the victory in Him. I guess somehow, subconsciously, maybe I thought that since He brought me this far, now I would be expected to go it alone. Or that maybe I couldn’t keep bugging Him for the same issues over and over. But that’s ridiculous. So then the study asked this question: Is there an area in your life in which God wants to give you a victory but an obstacle seems too big to overcome? Can you make a commitment today to begin measuring your giant obstacle against your God and not your strength? YES!! Why have I been relying on my own strength, which is lacking, when I should be continually relying on His strength? I mean, I’m doing ok in this battle, but my own strength is not sufficient! Philippians 4:13 (ESV): I can do all things through him who strengthens me. Is food, a food addiction or gluttony your Goliath? If David could defeat Goliath with just a sling, stone and, most importantly, his faith in the living God, surely I can find victory over food and find balance! I’ve been reading your post and it’s been very inspirational. I’ve been on slimgenics for one week and feel very crappy. I feel like I just want to give up but after reading your post I feel like I might just be able to do this. 20 weeks is nothing if you think about it but 20 weeks is so long if you really think about it. I’m going back and forth and keep thinking that I might have made a big mistake that I can’t take back. I was wondering if you would keep in touch with me and give me some tips. Hi Lee! I’m so sorry that this reply is almost a month after you posted. If you read my most recent post, you know that my life was thrown into turmoil right after writing this post… Either way, I’m sorry!! How are you feeling now? Any better? I know that when you very first start the plan, your body detoxes and you can feel horrible. Many people do – not uncommon at all. I pray you were able to push past it, because you WILL start to feel SO MUCH BETTER!! I love you blog! Please keep writing and keep us updated on your life in Austin! Thanks, Lauren! I appreciate the encouragement!